There are many great ideas that have been worked on in the cryptographic theory community that I've long wanted to see implemented in practical tools. Two of these, mathematically deniable authentication and forward secrecy, have now been implemented along with encryption by Ian Goldberg and Nikita Borisov to create the off-the-record messaging software OTR. Now you can have a conversation on the Internet as if it was just you and your buddy on a golf course. You do have to trust that your buddy on the golf course is not wearing a wire, and here Alice has to trust that Bob is not recording the conversation and vice versa. With mathematical deniability, even if your chat buddy records the conversation, third parties cannot mathematically prove that it was you doing the chatting. This is of limited practicality for legal purposes unless you use OTR via an onion router or similar: otherwise there is enough associated log data to prove Bob's identity in court even if mathematically it could be forged. Even an onion router won't save you if you leave identifying information in the actual conversation and your chat buddy records the conversation. This is because the laws of evidence typically put the burden of proving that such recorded data was forged on the person it is being used against. Nevertheless, in the normal course of operations presumably OTR lives up to its name and does not record the conversation, and your chat buddy would have to go way out of his way to make it do so. Of more practical use is the forward secrecy, which means that if your chat today is recorded by a third party in the encrypted form over which it is sent across the Internet, and that third party discovers your chat key in the future, that key can't be used to compromise the recorded but encrypted message. "Forward secrecy" means the key you used was destroyed after use, (like on Mission Impossible but automatically instead of with the self-destruct sequence drama), and even if future key(s) are compromised they can't be used to reconstruct the current key, and thus can't be used to decipher the current chat session. This presentation gives a good overview of the messaging software's rationale and the basics of how mathematically deniable authentication and forward secrecy work. It points out that the law endorses off-the-record phone conversations: normally and in most jurisdictions recording phone conversations without consent is illegal. Cryptography, for the limited problems it actually solves, is far more secure than the law. This article at The Register is the best layman's description I've seen. The basic idea is that Alice and Bob start by sharing a "key" that is a location and time interval for measuring radio transmissions from the same quasar. The couple (you didn't know that Alice and Bob are an item now?) can then use the voluminous "truly random" data generated by the quasar to generate secret cryptographic keys. Presumably the visible universe has so many quasars that it's sufficiently improbable that the adversary could guess and sufficiently difficult for the adversary to constantly observe all the quasars in order to observe and identify the transmission being observed by Alice and Bob. There is an interesting discussion about the idea at Bruce Schneier's blog. However, while this discussion addressed several smaller problems that must be solved before this technique can become practical and widespread, the discussion failed to address one issue that should be glaring. The biggest problem, which must be addressed with any physics-based "truly random" number scheme, is how do we know that these signals are "truly random"? On what physical theories and assumptions is this claim based? 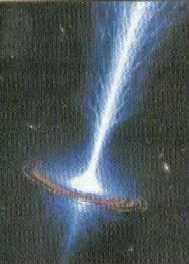 How do we know that scientists won't in the future learn more about how quasars work or discover new scientific laws that demonstrate regularity in the data once deemed random? Of course, as any good cryptographer knows, the fact that such data has passed all the statistical tests that we've so far devised is merely suggestive and hardly proves that the data is truly random, any more than it proves that a pseudorandom data stream is secure. There has to be a more basic argument to prove randomness, such as implausibility of >>c communications with respect to causality that would occur if certain quantum phenomena were not truly random. This is a problem that needs to be addressed for any "truly random" source, but some physical randomness assumptions and arguments are better than others. This is certainly not something we should take on faith or leave to physicists who by "randomness" merely refer to standard statistical tests rather than cryptographic criteria. See my articles on "true randomness" and the use of statistical tests in cryptography for more about this problem. When looking at the legal and political history that led up to the formation of the United States of America, judges and historians typically look to English royal and Parliamentary edicts as explanations and precedents for the American government. This is too limited a view. Usually neglected are the unheralded, deep, and indeed often dominant influences on the United States government from medieval, Renaissance, and Baroque-era era corporations. During these eras corporations took a wide variety of forms. Abbeys, monasteries and dioceses were ecclesiastical corporations; boroughs and cities were municipal corporations, and a wide variety of other corporations existed including merchant and trade guilds, universities, and hospitals. Royal law did not make a strong distinction between these different kinds of corporations as our law makes today between, for example, commercial corporations and municipal corporations. They were all "corporations and bodies politick" whose charters used the same basic form and language and which often were granted various degrees of judicial and police powers as property rights appurtenant to or held by the corporation. For example, the Physician's College in London, a medical guild, was a corporation that had the power (up until the famous case of Dr. Bonham) to imprison anybody practicing medicine without a license within seven miles of the City of London (itself a large political corporation). Nine of the original American colonies were colonial corporations whose charters granted them broad governmental powers subject to retention of "English liberties" by the residents therein and the king's right to collect customs on merchant shipping. "...one Body corporate and politique in Fact and Name, by the Name of the Governor and Company of the Mattachusetts Bay..." was typical language in these charters. These corporations were even sometimes (as in this case) sold from one set of investors to another: the modern legal distinction between commercial and political (e.g. municipal) corporations was not yet common. One indicator of the importance of the corporate form are its influences on the titles and symbols adopted by the United States. "Citizen" is shorthand for the denizen of a city: a member of a municipal corporation. Members of a king's realm in contrast are called "subjects." "Governors" were groups in charge of corporations (usually corresponding to what in modern U.S. commercial corporations are called "directors," but sometimes, as in many American colonies, singular), while "presidents" were chief corporate executives who presided over meetings of the governors. The head of the London College of Physicians for example was its President, and each of the three centers of the East India Company was headed by a President. "Secretaries" (as in Secretary of State, Treasury, Defense, etc.) were corporate managers. The corporate influence went far beyond style to the very structure of our government. Medieval republics usually operated under corporate charters, and English boroughs invariably did so. These charters were at the same time grants by the king (or treaties with neighboring lord(s)) and agreements among at least a majority of at least one of the "classes" or "houses" of the city. Thus, majority voting (among members of some class, not necessarily all residents), "houses" (often two) which must both agree by majority, and related aspects of our republican government, while often cloaked in classical republican terms, more directly derived from medieval municipal corporations. The idea that a majority can "consent" for other members their class also comes from medieval corporate law (it certainly does not come from contract or tort law). "Constitution" was often used as a synonym for "charter." The United States Constitution can be profitably viewed as a corporate charter, ratified by a majority of delegates to conventions in each State but shorn of royal imprimatur. "The Queen...grants..." became "We the people of the United States...do ordain and establish." "We the People" granted rights to ourselves, in some vague collective way. This makes no sense in legal terms outside the context of corporate charters. Of course, many titles and symbols did not necessarily have a corporate origin. "Senators" were an oligarchic body from ancient Rome that also existed in some medieval republics. "Congress" is simply derived from the word meaning a gathering, and "legislature" is derived from the Latin "leges" or statutory law. Nevertheless, the United States almost completely eschewed titles from the royal bureaucracy apart from the judicial branch, with its "judges," "justices," and many other titles and symbols, as well as procedural and substantive common law largely derived from the royal common law of England. Other important substantive areas of our constitutional law (e.g. the Bill of Rights) have diverse sources that include Parliamentary statutes and English common law. Even some of our judicial law is however derived from non-royal sources: equity comes from the law exercised by ecclesiastical corporations (canon law), and much of our commercial law derives from the law merchant which developed in franchise merchant courts separately from the royal common law. U.S. judges, justices, and historians thus make a grave mistake when they, to take a currently quite important example, identify the vague "executive power" of Article II with the old prerogatives of the King. The abuse of these prerogatives were one of the major reasons we fought a revolution and gained our independence from the United Kingdom. Given the corporate language and substance of the United States Constitution, it is more accurate to identify the powers of the President, where the Constitution itself is vague on the subject, with those (a) of the President and the Commander-in-Chief under the Articles of Confederation, and (b) if that is still vague, to those powers granted and reserved by charter to the heads of colonial corporations, in particular the corporate charters of the nine American colonies, (c) if the issue is still uncertain, to corporate law from the Norman Conquest to the Stuarts, and only if all those fail to give an answer to (d) the King whom we rebelled against, and only then if said powers were not one of the stated causes of the rebellion. Based on yesterday's oral arguments in LabCorp v. Metabolite, Harold Wegner predicts the likelihood that Justice Stevens will write the majority opinion and that this opinion will reverse and remand the case to the Federal Circuit. That court had held that the patent claim combining a scientific discovery with a prior art blood test was patentable. My observation is that if Stevens,who wrote the old anti-software-patent opinion in Parker v. Flook, keeps to his old (and the Supreme Court's old) philosophy regarding subject matter patentability, and extends his comments beyond "laws of nature" to other expressly forbidden categories (one of which is "algorithms"), there will be fireworks for business method patents and even software patents. Even if the Court applies a Flook-type methodology without expressly excluding algorithms from the scope of its argument, this could set a very big precedent that could be used to attack software and business method patents. I have previously written about the connection between Metabolite's controversy over patenting "laws of nature" and the origin of software and business method patents. In the paper "Elemental Subject Matter" I further describe how software came to be patentable despite the express prohibition against patenting "algorithms," and highlight the differences between the Federal Circuit's software-patent-friendly philosophy and Justice Steven's software-patent-hostile philosophy -- a difference of philosophy that easily extends to the "law of nature" at issue in Metabolite, raising the possibility that Metabolite will set a precedent redounding back onto software and business method patents. If Flook is applied in this way to reverse Metabolite, thus creating uncertainty about the validity of software and business method patents, expect a hue and cry among corporate lobbyists here on K Street, resulting in legislation to expressly designate software, business methods, or both as patentable categories of subject matter. There are, however, several other possible rationales for invalidating the patent in Metabolite, so Stevens may have a hard time gathering five votes to apply the Flook methodology here. Expect the Court's decision in June. I've written generally on the problem of measuring value. Civilization has progressed when we've discovered how to use better, but often quite non-obvious, proxy measures of value. One important kind of value measurement problem is estimating the inflation or deflation of a currency. The most popular estimate is a consumer price index (CPI) using weighted indexes of prices of a basket of goods and services. The CPI in turn is used to compute adjustments for inflation-indexed securities and pension schemes and"real" values for things like GDP, productivity, and so on. Richard Vermillion at Quicksilver Sulfide has a good post on the limitations of weighted price indexes for such purposes. I agree wholeheartedly that incomparability is a big problem for the CPI. I conclude that the CPI, and thus indexed investments and pensions and various "real" estimates of GDP and productivity are heavily error-prone and bias-prone. It is doubtful, however, that these problems "systematically make us overestimate inflation." Some other proxy measures of inflation suggest the opposite is the case. If one may generalize, technological progress over the last five years has increased value and decreased prices faster than other factors (e.g. rising regulations, rising money supply, and other political problems) have increased them in arguably luxury or zero-sum areas like entertainment and office bureaucracy (e.g. the oft cited rapidly falling costs and increased capabilities computers and associated products). But political factors have (to various degrees depending on your unit of measure) increased prices faster than rising technological productivity in traditional necessity areas such as food, housing, and energy. Furthermore, the problems Vermillion points out with choosing units of measurement (gallons of gas or miles driven?) are multiplied or exponentiated when it comes to comparing the value of gadgets that play music or movies or allow us to spiel on the Internet. What is a luxury and what is a necessity is itself quite debatable, and most categories are part luxury and part necessity. Prices of underlying real estate are mostly necessity (we need to be within commuting distance of our jobs), but the prices of houses themselves (especially after the big increases in square footage) are increasingly luxury. I take a long view and a global view, under which agriculture and its inputs (over the last century including oil) has been the dominantly important industry for about ten millenia and is still a crucial industry. Just because water is far cheaper than diamonds, or flour is cheaper than cable TV, to such an extent that we can spend more on the latter than the former, doesn't mean water should be (or in fact subjectively is) weighed far less than diamonds or bread less than a month's subscription to cable. Even though Americans probably spend more on cable TV than on food calories (or at least more than we could spend if we didn't insist on ingredients and recipes and modes of delivery until recently considered luxuries), there would be far more suffering if the price of food calories went up by a factor of ten than if the price of cable TV did so. People once found and will find other ways to entertain themselves without cable, but we can't do without calories. (Many of us Americans would be healthier with a few less calories, but that goes for cable TV too). There is a vast amount of interconnection between the different factors. Fuel mileage and thus the productivity of a mile of commuting may be up, but urban and suburban real estate prices and the associated commute distances probably have more than offset this factor in the ten years (not to mention value lost from extra time spent commuting instead of more enjoyable or productive activities). We could just leap over these variously biased and error-prone indexes if we could observe how people value a dollar tomorrow versus a dollar today -- time preferences. Although there are other influences on time preferences, I hypothesize that the dominant influence on time preferences overall for users of a currency is the expectation of inflation in that currency. Even if we can't accurately measure an overall rate of inflation, due to the problems Vermillion describes, we may be able to find a good proxy measure for it if we can find a good proxy measure for the overall time preference of currency users that doesn't involve first computing a "real" rate of interest. People sense price rises in the things they value, and thus come to their own estimates of past inflation, i.e. rises in the costs of their own budget due to external causes, and expectations of future inflation in the prices of things they value. I argue that this subjective inflation, and the expectation of future subjective inflation, are what a money issuer really ought to target: the issuer should observe proxy measures that most closely approximate overall subjective inflation expectation, and expectations of same, and expand or contract the money supply, via discount rates or otherwise, accordingly. For the purposes of estimating subjective inflation, I don't think interest rates work as a proxy measure. Here's why, giving as an example today's U.S. dollar interest rates. If dollar inflation is lower than the CPI indicates, as Vermillion argues, then real interest rates are positive, showing that folks prefer to spend a dollar on todays's technologically inferior and more pricier goods over a dollar on tommorrow's superior and less expensive goods. But if consumers have such "Luddite" or risk averse commodity preferences, then inflation may be much higher than Vermillion or the CPI suggest, meaning real interest rates aren't really positive. Using interest rates as an indicator of time preferences introduces a circularity when arguing for or against such preferences for the purposes of properly weighing a basket of goods. Another problem of using interest rates as a proxy measure for inflation expectations is that it is biased by investor behavior and in particular foreign inflows or outflows of dollars. If there is a larger dollar supply in the world returning home to the U.S. and chasing fewer investment opportunities, that will drive down interest rates despite subjective inflation expectations. If the economy using dollars is shrinking (either because the economy itself is shrinking or because some other currency is gaining favor, supplanting the use of dollars) and the dollar supply fails to shrink along with it, the result is both inflation and low interest rates. A better measure of consumer time preferences, and thus per the argument above consumer inflation expectations, may be to look at savings rates. Savings rates here in the U.S. strongly suggest that people aren't saving up to buy computers or audio or video players two years from now because these gadgets will be very important to us and more functional and cheaper than today. Rather, increasingly U.S. consumer budgets are going into goods and services that have been rising much faster than the CPI, especially housing and education. The negative savings rate strongly suggests, as do the price trajectories of the most objectively comparable goods (commodities and housing), that the CPI has for the last five years been understating inflation, and that interest rates in the U.S. are too low compared to this inflation to induce Americans at least to save here. (Foreigners are investing vast sums here, but that's another story). If Americans have been spending as if their dollars will be worth less tomorrow than today, perhaps we should respect that perception, technological progress in entertainment and office bureaucracy notwithstanding. The correlation between time preferences observed in U.S. consumer savings rates and a "consumer price index" far more heavily weighted towards necessities than today's CPI suggests either that (a) goods on the luxury end where productivity has been increasing tend to be "zero sum" status goods, or entertainment goods that only temporarily make us happier, so that the productivity increases won't actually make us much happier in the future, and thus don't effect much our time preferences compared to "positive sum" and "we'd be far less happy without them" necessities, or (b) that time preferences are very risk averse, and thus strongly weigh future water over future diamonds, despite our spending more on the latter in the present, or (c) a combination of both these factors. In both cases there are rational arguments to make for such preferences and in any case we should respect them and choose the units and weights of our price indexes consistent with them. Another reason to believe the U.S. CPI, at least, underestimates inflation is the intuitive argument that the organization that created the formula for the CPI (i.e. the federal government) is also the organization that stands to pay out vastly greater sums on i-bonds, Social Security, and so on should the inflation rates it reports go up. Even small biases in reporting inflation today lower the federal government's future liabilities by vast sums. It is also hard to recognize and correct any bias, since due to incomparability CPI units and weights could be debated ad infinitum. There is a wide lattitude of government choice among CPI weights and measures that cannot be proven to be right or wrong. Why would they not choose the values that best meet their budget preferences? However, to make this argument correctly one should invoke public choice or similiar theory rather than treating government as if it has the incentives of an individual; such an analysis is beyond the scope of this post. Whether or not we can find other proxy measures for inflation, Vermillion's basic point about incomparability and the dubious nature of the units and weights used in price indexes is correct. Unless there is a good substitute proxy measure for subjective time preferences and thus subjective inflation, (perhaps the savings rate as suggested above), we are stuck with weighted indexes. But measures based on these weighted indexes, including measuring the "real" values of GDP or of particular sectors or goods, measuring "inflation," and measuring "productivity" -- all these suffer from the incomparability of the goods and services in the index, and thus are much more error-prone, much more bias-prone, and indeed, much more prone to badly incentivized manipulation and fraudulent accounting than the usual economic pundits and advisors have been assuming. To get from John Rawls' "veil of ignorance" argument to his (and worse, most of his followers') favored wealth redistribution schemes requires (besides the ultimate fatal conceit that ignorant people can make rational contracts, as well as the dubious idea that we can pretend that we are ignorant of our own actual preferences) the rather extreme degree of risk aversion embodied in the "maximin" principle. As wikipedia summarizes maximin, "economic inequalities are only permitted insofar as they benefit the least well off members of society." How extreme the risk aversion this principle gives us depends on how small the group constituting the "least well of members" are...you get into strange and intractable triage hypotheticals about saving the life of one person up to the point where you'd cause the starvation of another...define your "least well off" group small enough and North Korea ends up looking like Beverly Hills in comparison to the maximin society. Except that death in Rawlstopia would be a pleasant Kevorkian-type suicide: if anybody died a painful early death, they'd be the worst off, so we must expend all excess resources to extend their lives to whatever slight extent possible and then give them a merciful sendoff. Others may be saved and fed only insfar as their talents are needed to attend to these worst of the worst off. Otherwise, when the worst off go it's the Kevorkian drip for the other eaters, too. Although many academics declare their intuition agrees with being very risk averse, those intutions are not made from behind the veil of ignorance, but from their position as (usually) kids of upper middle class origins who have never had a full-time non-academic job. Real poor people often act in a risk-seeking fashion, for example by buying lottery tickets. (1) FIRST, THAT WE HAVE GRANTED TO GOD, and by this present charter have confirmed for us and our heirs in perpetuity, that the English Church shall be free, and shall have its rights undiminished, and its liberties unimpaired. That we wish this so to be observed, appears from the fact that of our own free will, before the outbreak of the present dispute between us and our barons, we granted and confirmed by charter the freedom of the Church's elections - a right reckoned to be of the greatest necessity and importance to it - and caused this to be confirmed by Pope Innocent III. This freedom we shall observe ourselves, and desire to be observed in good faith by our heirs in perpetuity. So seriously did the Norman kings take the theory that they originally owned all rights in all things corporeal and incorporeal that were appurtenant to their kingdom, that they "granted" subsets of these rights to God Himself. Similarly, English kings would in this and future charters "grant" what were really recognitions of existing rights. In the case of electing bishops, however, this was a right that had recently been one during the Papal Revolution wherein the pope across Europe successfully asserted the right, previously usually practiced by kings and the more powerful feudal lords, to appoint bishops. This was the beginning of the idea of the separation of church and state. This separation however never fully took hold in England, as this part of the Magna Carta was abrogated when the English Church split from the Catholic Church during the reign of Henry VIII, and even before this time secular authorities assisted the "English Church" in punishing heresy. (13) The city of London shall enjoy all its ancient liberties and free customs, both by land and by water. We also will and grant that all other cities, boroughs, towns, and ports shall enjoy all their liberties and free customs. This similar sweeping language recognizing the enjoyment of ancient liberties and customs (but as individual rights of residents rather than as the corporate rights of cities) would later occur in many later North American colonial charters. In that context they were easements in favor or third-party beneficiaries rather than grants to the parties to the charter as here. This is the main clause of the first Great Charter of liberties under the English legal tradition. Unless otherwise specified, every liberty granted by the Great Charter is granted to all free men in perpetuity. "Free men" roughly meant all who were tenants rather than villeins (serfs). With the ends of serfdom and slavery it came to mean all residents, although it was sometimes construed just to mean all property owners or all citizens. Many modern property deeds use this same kind of language, albeit the rights they grant are usually far less valuable. The basic idea here is that, in exchange for being subject to military service, inheritance taxes are reduced to a small fee. Having a tenure such as fee simple held "directly of the Crown" was as close as you came to outright ownership under King John. Compared to modern zoning, except for restrictions on buying and selling you actually had far better property rights under King John with these "tenures" then we do under modern zoned "ownership." Indeed, our modern forms of land ownership are just these tenures, under the same names, e.g. fee simple, with taxes of various kinds instead of "aids" and "scotage." Arguably modern forms of ownership such as fee simple are held "directly of" our government instead of the king himself. If the Magna Carta still applies to those of us living under the English legal tradition, then arguably under this clause any of us who have ever been registered for the draft is immune to all but these minimal inheritance taxes. This might encourage the wealthy to stop bribing their way out of drafts the rest of us are subject to. This clause could come straight out of a modern law and economics textbook. The problem of "waste," wherein a temporary possessor of property loots it, is still a big problem in modern property law. It's also a big problem for the whole country when you have a temporary dictator rather than a king who expects his heir(s) to take the throne. By the way, the guardianship was actual alienable property -- once the king or lord granted guardianship of one of their underage tenants to somebody, that office could be bought or sold as well as devised or transferred via marriage. (12) No 'scutage' or 'aid' may be levied in our kingdom without its general consent, unless it is for the ransom of our person, to make our eldest son a knight, and (once) to marry our eldest daughter. For these purposes only a reasonable 'aid' may be levied. 'Aids' from the city of London are to be treated similarly. (14) To obtain the general consent of the realm for the assessment of an 'aid' - except in the three cases specified above - or a 'scutage', we will cause the archbishops, bishops, abbots, earls, and greater barons to be summoned individually by letter. To those who hold lands directly of us we will cause a general summons to be issued, through the sheriffs and other officials, to come together on a fixed day (of which at least forty days notice shall be given) and at a fixed place. In all letters of summons, the cause of the summons will be stated. When a summons has been issued, the business appointed for the day shall go forward in accordance with the resolution of those present, even if not all those who were summoned have appeared. In other words, for the king to collect his rents, i.e. "aid" and "scutage," he needed the consent of an assembly of his nobles (which became the House of Lords) and his other immediate tenants ("those who hold lands directly of us," which became the House of Commons). There is no representation at this point -- all the king's tenants who can take time off to come to give their "general consent" may do so (presumably by a vote, although whether majority, super-majority, or full consensus are required to obtain "general consent" is not specified). From this tradition came the American slogan, "no taxation without representation." Until recently there was a now neglected symmetry -- no representation without taxation. Our legislatures originated in both principles -- that tenants of the realm had the right to collectively negotiate their rent, and that only tenants who paid rent were entitled to so negotiate. I will soon be posting portions of a translation of the Magna Carta (the Great Charter) interspersed with my own commentary. Besides the background of the above link, here is some background on the nature of law and political structure in the lands of King John in 1215, and on why the document is more relevant to the modern United States than it is to modern England. What follows is a necessarily oversimplified summary, but it can be used to reconstruct almost all of the law of King John's England pertinent to Magna Carta. Such a summary must in some ways be very alien to modern minds, so if you question this summary in any way please read the Magna Carta itself first before commenting, as you will probably find that the alien law as I describe it is in fact reflected in that Great Charter. The basic building block of English legal and political structure was quite simple: property. Tyler Cowen talks about modern "markets in everything." In King John's England there was property in everything. Often, however, it was property that could not be easily bought or sold, but only inherited or transfered in marriage (like the kingship itself). Every political office and every legal right was such a property right. Jurisdiction, the right to make law, as well as goods and land -- all was property. Often these rights were appurtenant (i.e. attached to) rights in other kinds of property. For example, the jurisdiction and right to enforce judgments of manorial courts via certain remedies (a subset of the remedies available to royal common law courts) came bundled with tenure to the manor'sland. For example, if the king had granted a land to a lord in fee simple (i.e. perpetual) tenure, that lord would by an appurtenant express grant or sometimes implicitly (by prescription or custom) have jurisdiction over the manor's sub-tenants and villiens (serfs). Jursidiction over market fairs and their participants, and the ability to enforce court judgments by the limited remedy of distraining (attaching) goods in those markets, came bundled with the royal or baronial franchise to operate the market. Even in the 18th century, Blackstone described the entire political structure of England under the legal category of "the rights of persons." Every office and authority was held as a property right, and every liberty of a tenant or other subject was an easement that restricted such a property right. Tenures such as fee simple, estates for life, etc. are the ancestors of modern forms of ownership (which still go under these names), but are also akin to leases insofar as they entailed obligations such as to pay rent. Rent paid to the king included "scutage" and "aid" -- the ancestor of what we now call taxes. The Magna Carta forces the king to gain the "consent" of his immediate tenants via a vote of what became Parliament before collecting such rents. Tenancy was also in some ways akin to modern citizenship, as the obligations of a tenant often included providing military service and submitting to the jurisdiction of the landlord where such jurisdiction was appurtenant to that lord's property. The jurisdiction of the royal courts was appurtenant to the king's original ownership of his realm, and many lords also had jurisdictions appurtenant to their manors. Thus, the Magna Carta's language is quite akin to either a medieval or a modern property deed that grants various rights and reserves various easements appurtenant (i.e. attached to) the property in question. Any such deed, license, or charter grants a subset of the bundle of rights belonging to the current owner to the new owner or (in the case of a lease) tenant. The Magna Carta is such a property deed. The property in question is the entire kingdom and various subsets thereof, and the various rights and easements are appurtenant to the entire kingdom or particular subsets thereof. The rights the charter grants are to "all free men of the kingdom" or various subsets thereof. The "kingdom" is the property of the king and his heirs from which he is granting rights to English subjects and their heirs. Except for the king, who under Norman theory owned all original rights in the realm, these rights took the form of tenures (somewhat akin to our leases) and franchises. In theory all such rights became such by grants from the king. In practice these "grants" often recognized pre-existing rights. Thus they were akin to both prescriptive property rights and to natural or customary legal rights. These tenures or franchises were often granted perpetuity; sometimes they were for a term of years. If they were granted in perpetuity, under English law (which unlike Roman law did not recognize the totalitarian idea of sovereignty) they could not be legally taken back by future kings. The Magna Carta, for example, grants "all the liberties written out below, to have and to keep for them and their heirs, of us and our heirs." The listed liberties are a mix of rights granted to pacify rebellious subjects and the recognition of prescriptive rights, often of a very broad (unenumerated) nature. The totalitarian idea of sovereignty, derived from the ancient law of the Roman emperors in Justinian's Institutes, whereby emperors were the source of all law (the sovereign) and could always disobey or retract their own edicts, was much later adopted (at least the retraction part) in England as the sovereignty of Parliament. This new "democratic" sovereignty asserted that Parliament could abrogate rights granted in perpetuity by previous royal charters. This was the main legal idea in dispute in the American Revolution. The colonists argued that Parliament could not abrogate the royal charters to the colonies which, like the parts of the Magna Carta which recognized the rights of cities, towns, and the Church in a sweeping way, recognized customs and liberties of the inhabitants of colonies in a sweeping way. During and after their successful rebellion, the North American colonists adopted state constitutions, the Articles of Confederation, and the United States Constitution. These were modeled on previous royal charters and, contrary to the recent innovation of Parliamentary sovereignty that the colonists rebelled against, could not be abrogated by mere legislation. In a democratic compromise, however, (following James Wilson's vague idea of the "sovereignty of the people"), these charters were adopted by super-majority votes of "the people" (typically conventions of representatives) and could be amended by super-majority votes (legislatures, referendums, and/or conventions). Thus, the United States introduced democracy while maintaining the idea of perpetual rights that cannot be abrogated by mere majorities. Thus the Magna Carta, one of the earliest charters granting perpetual rights, is even more important to the United States than it is to the democratic, yet totalitarian, modern England. Research In Motion, Ltd. of Canada, the maker of the BlackBerry, has settled with NTP over its patent lawsuit for $612.5 million. Hopefully unlike the previous settlement this one will stick so that Americans can use our BlackBerries clear of these clouds. There were many interesting issues in this case, including cross-border infringement. Two other interesting parts of this case were the court's refusal to order an injunction and the U.S. Patent and Trademark Office (PTO)'s re-examination of NTP's patents. Any settlement would almost surely have been far higher if the injunction had gone through and if the PTO had not started rejecting NTP's patent claims. 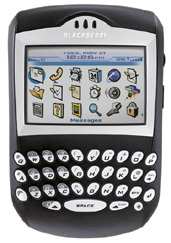 The importance of the "CrackBerry" to a wide variety of business and government operations could have worked greatly in NTP's favor, since the cost of shutting down BlackBerries in the United States could have cost RIM billions, but it also helped convince many politicians, who pressured the USPTO and perhaps the judge, that there was no way to shut down the network without disrupting some emergency services in the U.S. It will be interesting if we learn to what extent RIM's stated ability to quickly replace its software to avoid NTP's patents, in the event that the court did order a shutdown of the United States part of the network, was reality or a bluff. This was again a double-edged argument as on the one hand RIM hoped to convince NTP an injunction would not cost it billions, but on the other hand it might have convinced the judge that a shutdown would not cause the feared disruptions. The strategic landscape regarding this settlement was as a result of all these factors, and more, quite interesting. As I am fascinated by civil procedure and settlement strategy, I will probably be posting more about the strategy in this case in the near future. Why are wages flat and inequality growing? Both history and modern experience tell us that highly unequal societies also tend to be highly corrupt. There's an arrow of causation that runs from diverging income trends to Jack Abramoff and the K Street project. The last forty years or so have seen the imposition of environmental legislation and consumer product safety legislation, and numerous other government programs that serve to increase the costs of production. The great majority of people assume that the higher costs simply come out of profits and need not concern them. But the fact is that the general rate of profit in the economic system remains more or less the same, with the result that increases in costs show up as increases in prices, or as decreases in other costs, notably, wages. The real wages of the average American are stagnating in large part because the higher real wages he could have had...have instead been used to pay for the cost of environmental and safety regulations. Krugman is definitely on to something, but he's got the causation backwards. Public choice theory predicts that the rich have disproportionate lobbying clout because they have more concentrated interests. If there is a big motivation for lobbying -- namely the growing impact of federal taxes and regulations and income redistribution on all of us over the decades within which inequality has climbed -- the rich will do a disproportionate amount of that lobbying and will get an even more disproportionate benefit from it. The result is today's K Street. The generic semi-skyscrapers of K Street -- all required by law to be shorter than the Washington Monument -- are the true capital buildings of the United States, the capitals of corruption, just a few blocks away from where I'm typing this. It's the street under which I catch the subway home. It is in those stunted skyscrapers, rather than in the symbolic domed capital you see on TV, that most of our country's laws and regulations are in fact drafted. The wealthy -- not to be confused, as Krugman does, with those who happen to have a high income in a particular year -- have a disproportionate clout on K Street. As a result, federal regulation disproportionately impacts the non-wealthy, including those who are not wealthy but are trying to earn enough income to become wealthy. Reisman correctly explains why real wages aren't rising: productivity is barely keeping up with the unprecedented crush of government regulations and spending over the last several decades. When we add the disproportionate lobbying ability of the rich, who can thereby direct disproportionate costs of taxes and regulations increasingly towards the middle classes and poor, the great rise in government spending and regulation explains both flat wages and growing inequality. To Reisman's observations on business regulations I'd add the similarly strong and obvious but widely ignored connection between anti-growth zoning and rising housing prices. Housing now eats up historically extraordinary fractions of household income, and that is also a result of predatory government regulation. Not coincidentally, anti-growth zoning also benefits wealth (houses already built and owned) at the expense of income (people who have an income but not a house, who can increasingly not afford to buy a house near where the best income jobs are). Of course, another explanation for the supposed flat wages is that we don't and can't really know whether they have been flat, or rising, or falling: the measurements that go into computing inflation and "real" wages may be quite subjective and inaccurate, for a variety of reasons. But that is a post for another day. LEDs are more energy efficient and last far longer than light bulbs. But their color range has been rather limited. A graduate student at Vanderbilt University has discovered that you can paint LEDs with quantum dots . The color produced by the quantum dots, nanocrystals of a precise specific size, can be varied by varying the size of the crystal, but the result is usually one specific wavelength. Michael Bowers at Vanderbilt discovered that crystals of cadmium and selenium that contain either 33 or 34 pairs of atoms are both preferentially formed (thus making mass production easy) and emit a broad-spectrum white light akin to the sun or a standard light bulb. Another interesting application of quantum dots is for more efficient thermoelectric devices, for example devices to cool our increasingly hot silicon computer chips. Quantum dots allow a greater ratio of thermal to electrical conductivity -- that means more heat pumped while retaining control over the electric current. Also interesting is infrared paint. It seems to me that infrared-scale quantum dot paint might also be used for passive thermal control.